RunMags is a subscription based system with credit card billing. We don’t accept PayPal, wire transfer or checks. Sorry for any inconvenience this may cause! Typically we charge accounts on a monthly basis in arrears, but we also offer pre-paid annual billing with a 20% discount. Please let us know if you prefer annual billing. Only System Administrators can access the account settings to review which modules the company is subscribing to and enter credit cards for billing. 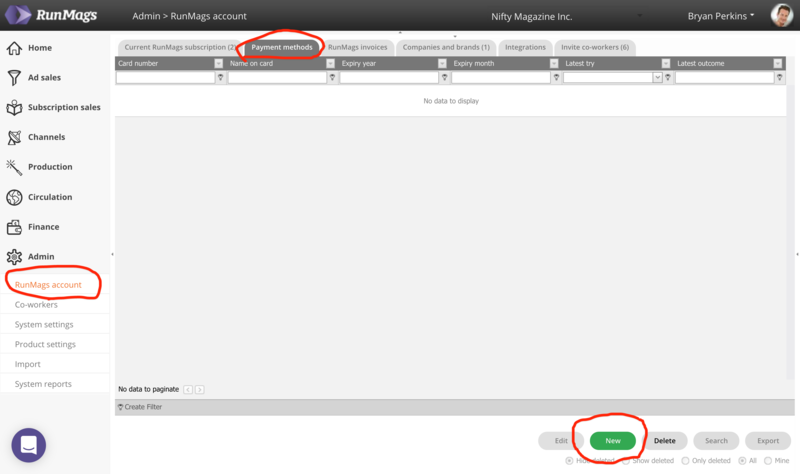 To add a credit card and continue using RunMags after the free trial is over, click on Admin in the navigation menu on the left side. Then click RunMags account . Under the second tab named Payment methods, you enter a credit card by clicking the green New button at the lower right. In the credit card dialogue box, enter your credit card and click Save. On the first day of each month, you will receive an invoice that you can review and if anything looks out of order, we encourage you to contact our support. Your credit card will be charged for charges accrued during the preceding month. All charges will be in USD. Note that you can have one or several cards on file with us and if you need to update your card you can first add a new card and then delete the old card.